Are your holiday parties a “B.Y.O.B.” affair? Or do you go all out with fancy theme drinks? Bourbon Negroni – The classic Campari-based Negroni gets a sophisticated update with fig- and pear-infused bourbon and a sweet hint of vanilla bean. Frosty the Caramel Apple Pie – Enhance this apple cider and butterscotch Schnapps cocktail with a classic fall garnish: an apple slice. Hoppin’ Hot Scotch – Turn basic hot chocolate into an adults-only drink with a splash of butterscotch Schnapps and amaretto. Chai Yai Yai – Brew a bag of your favorite chai tea, then add bourbon, amaretto and Grand Marnier to turn it into a celebratory drink. 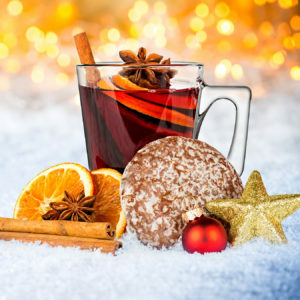 Mulled Red Wine Sangria – Spike Spanish red wine with orange juice and brandy and serves it warm with citrus slices for a steamy, autumn-inspired spin on sangria. Whatever the occasion or whatever your taste, Bill’s Package Store has the right ingredients to make your fall parties a success. Bill’s Package Store offers superior quality, top-shelf brands of your favorite liquors at the lowest prices in Clarksville, TN.